Lil Ray just hit me off with this new ish, the Lord Finesse beat is soooo old school and the end product is pure Lil’ Ray. He gets all lyrical and goes through all the types of spots, different foods and crazy local ish you find in Beijing, and then spits it all around over the beat again. 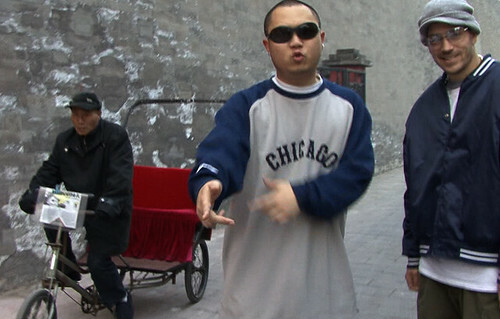 Golden Era hip hop coming straight out of Beijing in ’10. 牛B!!!! I came across some photos taken at a shoot in 2008 for ABD‘s album called “Made in China” by Made in China Records. Thought I would share this with my You Call That Hip Hop family. Here are few tracks to listen on and some photos to check out! M2 aka El Maya and Skeewe, representing Texas and Guatemala, were both holding it down in China for years, and while Skee has moved on to Indonesia where he is doing tours and shows, M2 is still in Beijing and will put out his solo album later this year. Just some random stuff to toss up here… recently I’ve seen some hip-hop’stas in Beijing rocking the NC gear… even though we are not playing that well this season, I gotsta support my Tar Heels. Bizzle Be Back in Business! New (old) TRACKS! OK OK OK… i took WAY to long to get back on this blogging game, but as you see from the categories…blogging is hard. Anyway without wasting much time, I want to give you a few tracks I am listening to right now. Next up after this post, I will talk about meeting Stretch Armstrong, DJ Wordy’s crazy set with DJ Krush at YuGong, me looking ridiculous at a house party, and Lil Ray getting robbed again (of the title, not physically jacked) at the Iron Mic finals. yeah buddy, i like those two tracks right now! Look at the grill!!!!!! Don't hurt em XIV. that line right there…hit me the right way!. To me, it could mean good at making money but better at spending it… or since the similar/same pronounciation means 老郑 which is XIV’s Chinese rap name so with 更好花 it would mean “XIV is better at getting lifted than you!” Ahhh Chinese. Anyway LISTEN TO THE TRACK. I recently got my hands on a copy of Lil’ Ray AKA Naughty Ray‘s new single, recording with LA Local Legend Aidge Rock of The Aesthetics Crew. There is an original track and a remix, and both are fiiiiiire. See below for more on The Aesthetics Crew and keep an eye out this week for my upcoming biography and interview with Lil’ Ray, Beijing’s premier Battle MC. In the mean time, enjoy this taste of Beijing’s finest going global. In the hallowed brew-school tradition of cup-in-hand rhyming at backyard house parties, the Los Angeles-based Aesthetics crew is here to put the fun back in the funk. Somewhere in between “too jiggy for my diamond studded toothbrush” and “so underground it hurts to take off my backpack,” they are simply committed to saying whatever is on their minds. From Jazz champions to Hungarian comedians, they have mastered the art of flipping old samples to deliver an entirely unique and personal feeling in their music. The heavyweight combination of Indi’s MPC 3000, DJ Props’ SP1200, and a warehouse full of records is truly a force to be reckoned with. Firm believers that an MC’s delivery should rock like Donald Byrd’s horns over his rhythm section, Aidge & Indi’s vocals are distinct and powerful. Unlike many artists who separate their lyrics from the instrumental side of the art, the Aesthetics Crew considers their vocals to be part of the music, much like a single instrument amongst the rest of the band. Their lyrics will make you think, laugh, and more than likely, crack a brew. The Aesthetics Crew is exactly what their name implies; they represent everything beautiful about this art form, and won’t stop until their names are synonymous with the forefathers they grew up listening to. Let Aesthetics into your eardrum once, and they’ll be in your brain for a lifetime. 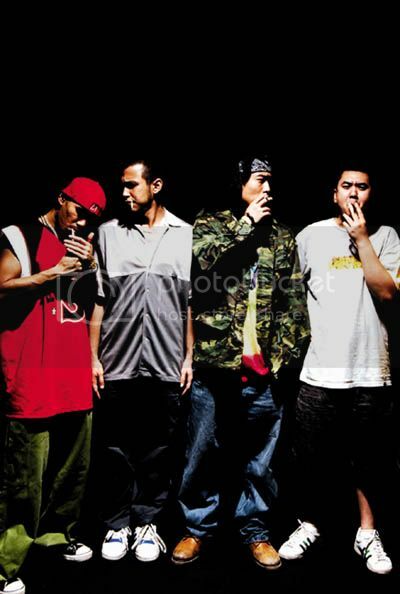 D.I.B.C- Diggin’ in a 胡同 (Hutong) Near You! American Hip Hop’s most famous ‘Diggaz’ gotta be D.I.T.C (Diggin In The Crates) crew led by the late Big L. (For more on the D.I.T.C click here) Regarded as one of the most beloved hip-hop crews in rap music [of its time], D.I.T.C. was made up of several veteran rappers, DJs, and producers “dedicated to the true essence of rap music: original lyrics and strong beat-savvy productions sampling dusty vinyl.” Members and associates include Showbiz & A.G. (Andre the Giant), DJ Premier, Diamond D, Lord Finesse, Fat Joe, O.C., and Buckwild. Other than Fat Joe, most members have never reached the “success” of other multi-platinum artists, but still, Xiao Bizzle thinks they represent the best parts of hip hop. One of Beijing’s most notorious Diggaz‘ is Lil’ Ray aka Nasty Ray aka Naughty Ray aka Blacksound aka aka aka…sorry got stuck there for a second.. Ray is also Beijing’s top up-and-coming force in the chip-chop circuit and China’s preeminent Freestyle and Battle rapper. (Click here for more on Lil’ Ray) He and his crew have put together a really tight website called Diggin in Beijing City (D.I.B.C) where they post rare and hard to find CD’s and mixtapes they find around Beijing and online. Here is a Lil’ Ray song to let you know how he does things…he and XIV rap the song almost entirely in Beijing Dialect…see if you can hear the difference! One recent D.I.B.C. post I also want to highlight is the album feature for 阴三儿 （IN3 pronounced Yin San’r) which most mainland’ers regard as Chip-Chop’s #1 rap crew right now. I will give more details and a bio for IN3 in the future, but for now, click here and download some of their music to get acquainted with IN3‘s 地道(dìdào- Authentic) Dirty North style!